Two main ingredients with some spices. Less than 15 minutes and a quick 4-step recipe. Let me present Aloo Beans or Indian Green Beans Curry with Potatoes made in Instant Pot or Pressure Cooker. This is a vegan & gluten free recipe, perfect for a vegetable side dish! This is such an easy recipe that I did not even bother to show the steps! 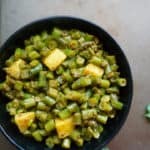 This is the simple North Indian Green Beans subzi recipe, where we don’t add onions or tomatoes while cooking green beans. We simply add tempering with cumin seeds and some basic spices. We usually find green beans in the produce section of the local store and treat them as part of the vegetable family. However in a more science-based context, green beans rightfully belong in the beans & legumes family. They have a very similar nutritional profile to legumes, such as they both provide concentrated amounts of fiber, folate, and numerous minerals. A one-cup serving of cooked green beans provides about 45 calories and 10 grams of carbs. We add very little water when making this dish, as we want a dry stir fry kind of result. Pressure cook for just 2 minutes and then quick release the pressure, so that the potatoes and beans don’t overcook. I added both green beans and potatoes to this recipe. To make it paleo, you can skip the potatoes and make only green beans. You can certainly make this in a sauce pan. Just allow few extra minutes for cooking. Cover with a lid, which will help to expedite the cooking. 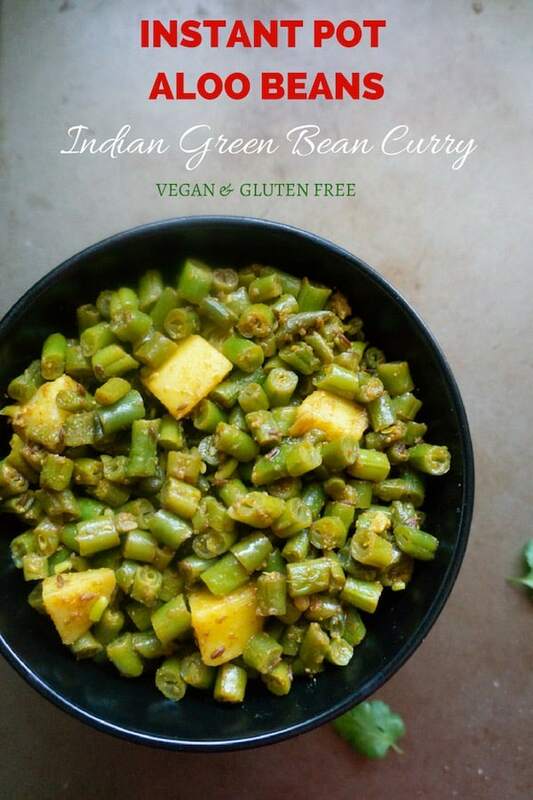 This this Indian Green Beans Curry. It is healthy, vegan & gluten free. It works great as a vegetable side dish. Enjoy it with some rice, naan or roti, along with a side of lentil soup (dal). 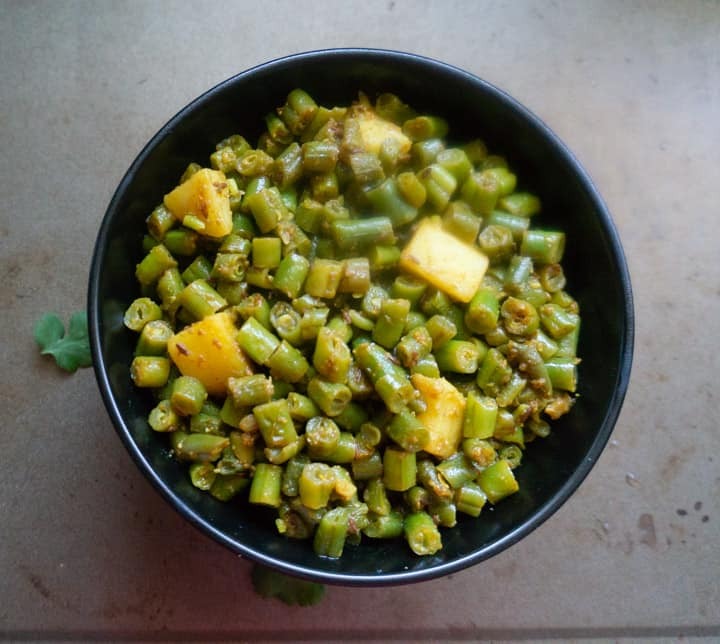 Easy Aloo Beans or Indian Green Beans Curry recipe prepared with cumin, garlic and spices in just 15 minutes. Vegan & Gluten free vegetable side dish. When the cumin seeds start to splutter, add chopped green beans, potatoes and water. Add spices except dry mango powder and mix well. If anything is stuck to the bottom of the pot, scrape it off. Mix in the dry mango powder. If there is any water, change the setting to saute mode and get it to your desired consistency. Aloo Beans are ready to be served with roti or naan. Heat a pan on medium heat and add oil to it. Then add cumin seeds, garlic and green chili. Saute for a few seconds. 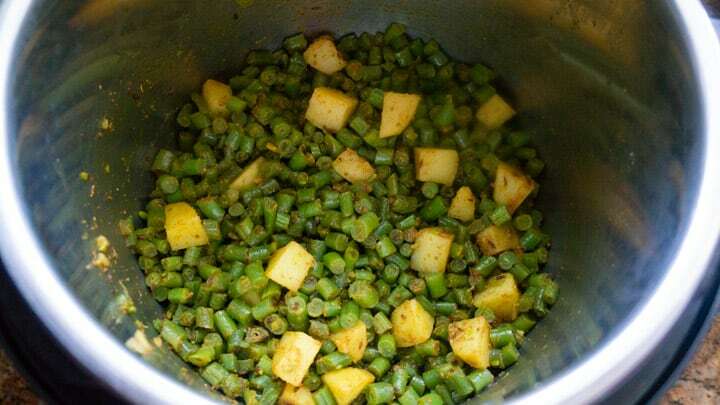 When the cumin seeds start to splutter, add chopped green beans, potatoes and water. Add spices except dry mango powder and mix well. Cover the pan with a lid, and cook on medium-low heat until the potatoes and green beans are cooked and tender. This will take about 10-15 minutes. Stir occasionally. Mix in the dry mango powder. If there is any remaining liquid, then cook uncovered for a couple of minutes. Aloo Beans are ready to be served with roti or naan. What if you use frozen beans? Would the cook time need to be adjusted? Hey Radha – I have not tried, but I think the same cook time will work. The instant pot will take longer to come to pressure. Would love to hear if you try!